Although RebelEconomist has always been sceptical about the more alarmist views of the global economic slowdown, he was unconvinced by Reuters' columnist John Kemp's argument, as reported by FTAlphaville, that rising commodity prices indicate that there is little or no output gap at the global level. The explanation given by John Kemp is that a negative output gap does exist in the advanced economies, but is largely offset by strong growth in emerging economies such as China. And since FTAlphaville's bloggers were enthusiastic about the idea, and seem set to refer to it again and again in future posts, RebelEconomist presents his own analysis here, which shows that a more sophisticated time-series estimate of the output gap does suggest that an output gap exists at the global level. Briefly, the output gap theory is that actual output can differ from the potential output given by the productive capacity of the economy, and that this gap affects inflation. Most commonly, actual output falls short of potential output, in which case the output gap is defined as negative, and producers tend to mark down prices in an attempt to stimulate more demand to take up the slack. Such situations typically arise from deficient demand, in response to which producers can leave some fraction of their capacity, including both labour and equipment, unused or under-used. Actual output can conceivably also exceed sustainable potential output by measures like paying workers overtime to take less rest and postponing routine maintenance of equipment, although producers' ability to do this is limited by the tolerance of their existing workers and equipment, meaning that such a positive output gap cannot grow large or last long. During such periods when the output gap is positive, producers can be expected to mark up their prices to recoup their additional costs, which naturally chokes off some demand. For most countries, actual output is either counted directly or can be estimated reasonably accurately from related observations such as electricity production, but by its nature, unused productive capacity is harder to observe. Given good economic statistics and knowledge of the economy-wide production function, it is possible to deduce productive capacity from surveys of the factors of production including labour and capital. A less demanding and commonly-used method is to estimate the output gap from the time-series of observations of actual output. On the assumption that macro-scale economic capacity grows steadily, potential output can be estimated by fitting a trend to the path of output, perhaps excluding the observations covering dips in actual output associated with economic slowdowns, but not excluding the peaks if positive output gaps are considered negligible (indeed, sometimes the trend is obtained by fitting a curve through the peaks only). The divergence between that trend and actual output, or to be more precise in graphical terms, the length of a vertical (ie parallel to the output axis) chord between them, is then taken to be the output gap. During an ongoing negative output gap, which is unfortunately when interest in the output gap is likely to be greatest, potential output has to be estimated by extrapolating the trend to the end of the series, which is a more ambiguous procedure than bridging a trough in the middle of the series. There are at least two weaknesses with this output gap approach to assessing inflationary pressure. First, the assumption that potential output varies smoothly seems heroic. Obviously, disasters such as war or earthquakes can wipe out large parts of industry at a stroke, but more subtly, productive capacity constructed and organised to suit a particular understanding of the state of the economy may be rapidly rendered obsolete if actual events falsify that view. The latter scenario is arguably applicable to the present post-financial-crisis period, with the crisis itself arising as people in various developed countries with current account deficits realised that the course of debt-financed consumption growth that they were on was unsustainable, not least in the face of growing competition for resources from the developing countries. This account has been popularised in the blogosphere by Arnold Kling as a "recalculation", but has roots going back at least as far as the "malinvestment" concept of the Austrian school of economics. Clearly, if the productive capacity of the economy can in fact undergo a sharp contraction, a trend-fitting approach will yield an overestimate of the (negative) output gap for such periods. In other words, the slowdown in economic activity would reflect structural factors rather than deficient demand, implying that any attempt to boost demand to take up the estimated spare capacity will just drive up prices. Second, the economy-wide relationship between the size of the output gap and its influence on inflation of the general price level may well be complex, perhaps allowing rising prices in some bottleneck industries, such as commodity production from Earth's finite resources, to coexist with reported spare capacity in other activities and hence in the economy as a whole. 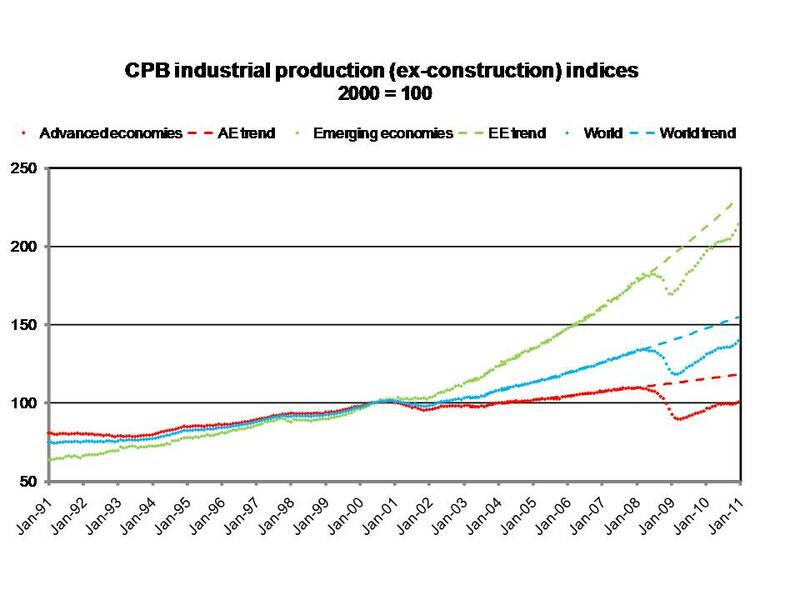 In an expanded analysis emailed to Reuters' clients (which does not seem to be freely available on the web) John Kemp presented a chart of advanced, emerging and world economy industrial production from the monthly World Trade Monitor published by the Netherlands' Centraal Planbureau (CPB). From this, he inferred, apparently by visual inspection with some kind of linear extrapolation of the recent trend in mind, that emerging economy output is roughly on trend and advanced economy output is catching up, so that, as he put it, "for the world economy as a whole, the output gap is probably small or non-existent". This inference is based on a kind of optical illusion. 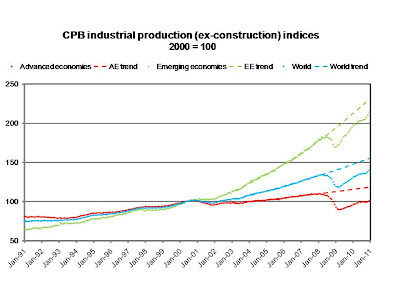 The chart of CPB industrial production data (to be precise, the volume of industrial production excluding construction, expressed as an index based on the average level of industrial production over the year 2000) is reproduced below. Here, global industrial production is calculated as a weighted sum of advanced and emerging economy values, where the weights are given by their shares of world production in 2000, comprising 65.1% and 34.9% respectively. First, as is evident from all three time-series, while there are inflections in output growth, it is an essentially exponential process. This means that a linear extrapolation of the trend to the end of the series fails to capture the characteristic steepening of the trend as time progresses. When exponential trends are fitted to the relatively stable growth of all three series in the five years prior to the onset of the financial crisis (taken to begin with the demise of Bear Stearns in March 2008, hence the trends are fitted over the period March 2003 to February 2008 inclusive), as shown in the chart, it is clear that actual output remains divergent from trend right up to the end of the series (December 2010). Second, because emerging economies are growing faster than advanced economies (their fitted trends grow at annual rates of 9.5% and 2.5% respectively, with world industrial production expanding at 5.4%), the emerging economy trend is steeper at the end of the series, implying, for any given parallel separation between the trend and actual path of output, a longer vertical chord between them and hence a larger output gap. By my reckoning, in December 2010, even the emerging economies had a (negative) output gap representing 16.7 output index units or 7.2% of trend output at that time, while for advanced economies the output gap was 17.6 output index units or 14.9% of trend. And naturally, when the smaller but nonetheless significant output gap in the emerging economies is weighted by their relatively small share of world production, it does little to mitigate, let alone offset, the larger output gap in the advanced economies, so that it is clear that a sizable output gap does exist at the global level. Based on the trend fitted to the world output time-series directly (rather than being constructed from a weighted combination of the trends for emerging and advanced economies), the output gap at the global level is 15.1 output index units or 9.7% of trend. In conclusion, while it is possible to debate the validity and significance for inflation of time-series output gap estimates generally, fitting a realistic trend to recent years' output observations for the advanced, emerging and world economies rather than judging the trend by eye, and carefully measuring the gap between that trend and the actual observations against the output scale, strongly suggests that an output gap does presently exist at the global level. Dear Rebel Economist -- You make some very good points in your commentary on my column, and some of the critiques are well-taken, but I think your method of implying an output gap is not correct and stand by the thurst of my original article. Crucially, we both need to make clearer what we mean by "potential output" and how it should be calculated. The key restriction on potential output at present is clearly commodity production not labour markets or manufacturing capacity. In this respect, it may not be realistic to simply extend the trend either linearly or using a constant exponent for potential output. In fact it almost certainly is not realistic. Your estimates of 7.2% and 14.9% negative output gaps for emerging and advanced economies respectively are simply not realistic. The world simply does not have enough oil, iron ore, copper, cotton, coffee or cereals to raise output this much. In fact accelerating commodity prices in 2007-2008 suggest the global economy was ALREADY operating beyond its maximum sustainable capacity at this point. The implication is that trends should be calculated from a much earlier base (2005? 2006?) and that the AVERAGE sustained rate of growth may be much slower than the pre-2008 curve implies. It is not clear that the global economy has added much capacity in the crucial commodity sector since 2008 -- certainly not exponential capacity. Yet demand is already far above this level. It is in this sense that it is clear the global output gap is small or non-existent. St Louis Fed President Jim Bullard (no friend of the inflation nutters) made a similar point in the last few days in a powerpoint now available on his website. Like you, I am no fan of output gap analysis -- at least in its more rarefied forms -- since it contains too many assumptions about potential output to be really useful. But it is regularly cited by Bernanke, Yellen, King and others as a reason to keep rates lower for longer. The CPB data provides a useful corrective to that rather narrow national perspective. As the economy becomes more globalised, central banking policy must also give greater weight to international factors. If getting people to focus on -- and think about -- the existence or otherwise of a "global output gap" shifts attention to some of those international influences, it will have improved policymaking and understanging immeasurably. I agree; a smooth trend of any form is probably not a realistic representation of changes in potential output. Actually, I already had, as an afterthought, fitted the exponential curves to each whole series from 1991 to 2010. Naturally, with just two parameters, they fit the series very poorly, but I think they do give a reasonable impression of the average growth rates over this longer term. These growth rates are 6.5% for emerging economies, 1.5% for advanced economies, and 3.3% for the world. If alternative trends are constructed by extrapolating the series at these longer-term average growth rates from the March 2008 observation, the output gaps are +2.3% (of trend), -11.9% and -4.1% respectively. In other words, this approach would indeed show emerging economy growth had risen back above trend. However, these "trends" all have a noticeable discontinuity in March 2008, so they would be clearly inappropriate as examples of a trend-fitting approach to determining the output gap. Where I might differ from your comment, however, is in the idea that the world does not presently have enough commodities to raise output much. Given that under-employed workers and idled capacity reportedly do exist, there must be some potential to raise output if these factors of production could be drawn into use, for example by making production in advanced economies more labour-intensive. So what may be happening is that there genuinely is an output gap, which represents the lack of adjustment in the overall production process, especially in advanced economies. A right-wing economist might say that, if unemployment benefit was reduced, some of this surplus labour would be forced to become employed, and output might be supplemented by more labour-intensive services such as shoe shines. Not being this conservative myself, I would say that some period of under or inefficient use of resources following a shock is the price that advanced economies are willing to pay for social cohesion. The trick is, however, how to make sure that it does not become permanent. And, I should have added before I hit "return", thanks for your comment John! Regarding a "commodities output gap", you both might be interested in this: http://gregor.us/non-opec/portrait-of-price-vs-non-opec-supply/. Thanks Anon. Clearly, oil is a key commodity. I did note from the post you link to though that there apparently was eventually a supply response to the oil price spike in 2008, but that spike was so short-lived that the supply response did not progress very far. What worries me about this is that the political pressure to "do something" about high fuel prices will lead governments to interfere with the market response by either increasing fuel subsidies or cutting fuel taxes, especially in countries with a large budget deficit, as in the UK where the government is wavering about going ahead with a scheduled petrol tax increase on April 1st.